Beautifully fragrant, antibacterial, anti-inflammatory, and edible, rose water is an extremely versatile item to have on hand. Save dollars and ensure the purity of your product by making your own DIY rose water – a surprisingly simple process. Stopping to smell the roses may be the best thing you can do for your stress levels and heart health: the scent of rose has been proven to reduce blood pressure and levels of cortisol, the stress hormone. Rose can also help relieve the symptoms of depression and anxiety. A study published in the journal Complementary Therapies in Clinical Practice found that postpartum women treated twice weekly with a rose/lavender aromatherapy oil experienced a significant decrease in postnatal depression scores, and a marked improvement in general anxiety disorder, when compared with the control group. Plenty of research exists to show that rose has wide spectrum antimicrobial activities. It also exhibits antioxidant properties. In addition to its antibacterial properties, rose water is believed to reduce redness and inflammation, and to balance the skin’s pH, making it the perfect beauty treatment for those suffering from acne, eczema, and psoriasis. What’s more, German researchers discovered that rose oil increases the skin’s permeability, allowing it to soak up more nutrients. Of course, this is only good news if you make your own beauty products full of natural ingredients. The soothing floral notes of rose have been shown in trials to promote a good night’s sleep. When hospital patients were given rose aromatherapy for three subsequent nights, it was found that the scent significantly improved the sleep quality of participants when compared with the control group of patients. This is the easiest and quickest way to make your own rose water, although it doesn’t have a very long shelf life. It’s ideal for culinary or beauty purposes. Add the petals and water to a saucepan, cover, and bring to a boil. Turn down the heat and simmer for 10 minutes, until the rose petals fade in color. Allow to cool completely. Pass the rose water through a cheesecloth or fine mesh sieve. Decant the pure liquid into a sterilized glass bottle, and store in the refrigerator for up to two weeks. This clear-colored distillation is slightly more difficult to make, but it will last much longer than the simple simmering method. Add a clean brick or large rock to the center of a large pot, and place a metal bowl on top of the brick. Add the rose petals to the pot, and add enough water to come to the top of the brick. Place the lid, upside-down, over the pot (so the steam can drip down the center of the lid and into the bowl). Some ice cubes placed on the lid will speed up this process. Bring the water to the boil, and allow to simmer for 30 minutes. Ensure you keep in as much steam as possible, as this is what you will be using as rose water. Allow to cool completely before decanting the water from the metal bowl into a sterilized glass bottle. Store in the refrigerator for up to six months. There is a third method for making rose water, using rose essential oil. While this method is safe to use for external beauty treatments, it should not be ingested or used for culinary purposes. Mix the essential oil and the vodka together, before adding to a sterilized glass bottle with the water. Store in the refrigerator, shaking before each use. 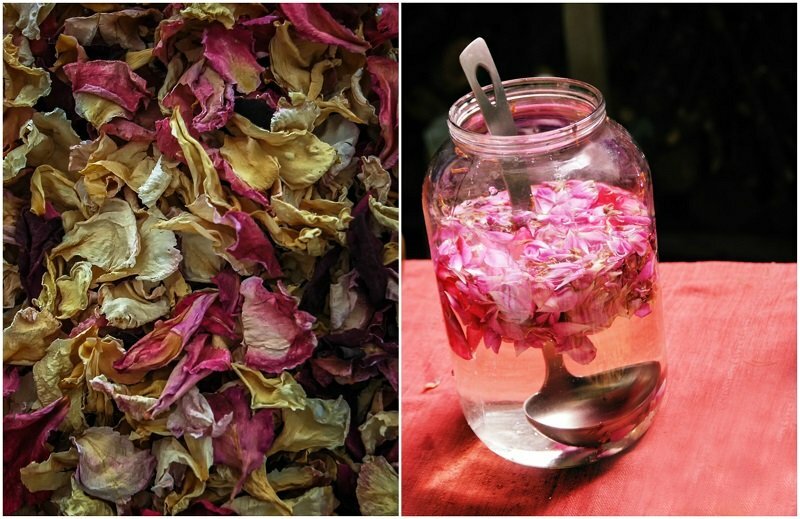 Now that you have made a batch of homemade rose water, why not put it to good use? Here are a variety of ways rose water can be used for health and beauty, or even in the kitchen! Avoid the multitude of toxic skincare ingredients – including artificial fragrances – by making your own perfumed spray. Simply pour rose water into a spray bottle and add drops of your favorite essential oils until you get the blend you like. Remember to shake the bottle each time before you spritz to distribute the oils. Keep your homemade rose water nearby to cool and hydrate your skin during hot days. Its antibacterial and anti-inflammatory properties will prevent spots and quell redness. You can also add ingredients like aloe vera, witch hazel, or vitamin E to further support and nourish your skin. This recipe, which contains omega fats and evening primrose oil, is also a great choice. Because of its astringent qualities, rose water makes a great facial toner for oily and acne-prone skin. Simply add a tablespoon of rose water to a half cup of distilled water to soften and rejuvenate. Removing stubborn mascara and eyeliner can be a tough job, with many believing that natural products aren’t up to the task. This eye make-up remover contains just two ingredients yet it is sure to get rid of every last trace of mascara on your lashes. Mix equal amounts of homemade rose water and jojoba oil, apply it to a cotton ball and use it to gently cleanse the eye area as normal. Rose water’s natural antimicrobial properties mean it’s a great way to kill the fungus and bacteria which can result in dandruff and other scalp conditions. It is also believed to balance the pH and minimize the porosity of the strands. Use a cup of rose water as a final rinse after washing to add luster and shine to your mane. You can also dilute your regular shampoo and conditioner with rose water for antiseptic properties and a delightful scent. Freshen up bed linen, clothing, and fabric furniture with a few spritzes of rose water. Add a few drops of rose or lavender oil for a more lasting scent and extra antibacterial action. Conventional after-sun treatments can contain many of the same chemicals and pose some of the same dangers as conventional sunscreens. 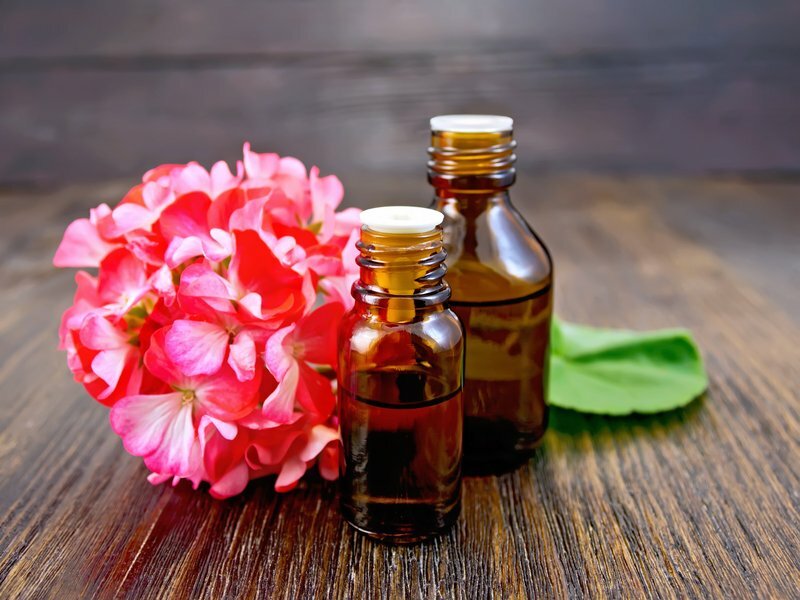 This homemade sunburn spray – with rose water, aloe vera, apple cider vinegar, and essential oils – will provide relief while soothing and repairing your skin, rather than causing further damage to it! Reduce anxiety, depression, and stress, by spritzing some rose water on your pillow before bed at night, spraying some on your hair or clothing, or even adding it to your diffuser with a few drops of lavender oil. Your stress levels (and perhaps even blood pressure!) will soon fall. Adding a cup of rose water to you bath, along with a few rose petals, can instantly relieve the worries of the day. It will also soothe and nourish your skin, while setting you up for a restful night’s sleep. Although the idea of rinsing with rose water doesn’t seem quite as refreshing as peppermint, it can be just as effective as using a conventional mouthwash, yet far less harsh on your teeth and gums. For extra antimicrobial powers, add a few drops of your favorite essential oil. Just woken up with puffy, swollen eyes and need to get to work? The anti-inflammatory effects of rose water mean it’s the perfect treatment to have on hand for such an occasion. Spritz or pour some chilled rose water onto cotton pads and place them on your eyes for five minutes to cool and soothe. Rejuvenate your skin, remove dead cells, and add fragrance with this fantastic scrub recipe – made with natural sea salt, almond oil, rose water, and vanilla. Rose water adds a subtle floral hint to a variety of dishes, particularly anything dairy-based, fruit-based, or nut-based. Try this flavor-filled Rice Pudding with Rose Water and Cardamom, a traditional Moroccan Carrot and Rose Water Salad; a creamy and fruity Yogurt Panna Cotta with Blueberries; or these delicious Pistachio Rose Water Cookies. All manner of drinks will benefit from the addition of rose water – from teas and tonics to cocktails and coolers. This Persian Style Iced Tea is sure to cool and refresh on a summer’s day, as is a pitcher of Rose Water Lemonade. Smoothie lovers can elevate their game with a Fig and Rose Smoothie; while cocktail connoisseurs won’t want to miss out on a Lemon, Raspberry and Rose Vodka Cocktail or a Cucumber and Rose Gin.